At a time when the famous Monza banking is under threat, we thought it appropriate to include a picture from the race that celebrated the Autodromo's 50th anniversary. 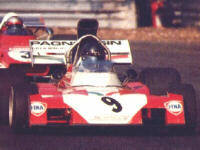 It also shows a good shot of Andrea De Adamich, Formula 1's perennial 'third car driver' of the seventies. Third works entries were a common phenomenon in those days. But most times they were connected to one-off appearances for star drivers, like Amon driving a third Tyrrell at the Glen or Ickx jumping into a McLaren seat at the 'Ring after falling out with Ferrari, both in 1973. Third entries were also used to give upcoming youngsters an opportunity in their home race - like Depailler's Tyrrell debut in France. But never has there been any driver perfecting the skill of third works driver better than De Adamich. Ever since his Ferrari opportunity in 1968 Andrea's F1 career has been that of 'the third man'. With the help of Alfa Romeo - for which he starred in prototypes, winning regularly with the marque's T33 - he got himself back into the F1 frame driving Alfa-engined McLarens and Marches, never getting anywhere close to the front. When the Alfa supply dried up, his faithful backer, ceramics manufacturer Pagnossin, got him into a similar semi-works situation at Surtees. There, things went marginally better: in 1972 he scored the first points of his career with 4th in Spain. Here, at Monza, he qualified a lowly 21st and retired with brake problems. After the 1973 South African GP, he switched his Pagnossin money to Brabham, where a big damage rate at Zolder gave him another unexpected 4th place. The Scheckter carnage at Silverstone (only now surpassed by David Coulthard's fine day at the office at Spa) spelled a sudden end to his F1 career, with De Adamich getting caught up in the flying wreckage and injuring both his legs. Ironically, his single Ferrari appearance remains his best GP qualifying effort. After his racing career Andrea became a respected motorsport journalist and TV commentator, while these days son Gordon De Adamich is driving Alfas in the Italian Superturismo championship.